I started using Gmail regularly after I graduated from college in 2008 (once my college Exchange-based email account was gone). My emailing was noticeably sparse from May 2008-May 2009. During that time I was a teacher, and I didn’t spend nearly as much time on a computer as I do now. You can also see a gap during the summer of 2011. 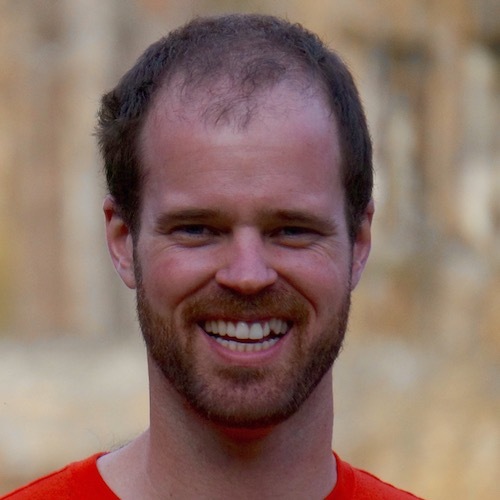 I was working at Kiva Systems at the time and primarily used my company email. On the horizontal axis, you notice I’m pretty silent between 11 PM and 7 AM. I need my sleep, and I never work at night! My emailing is light from 6-9 PM too. 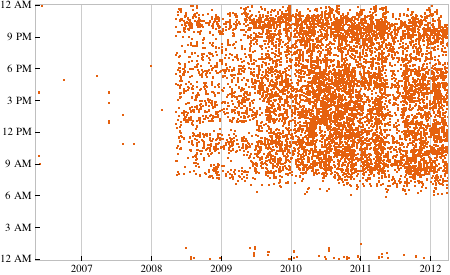 Here’s a graph of my email received over the past six years. It comes in pretty heavy from 8 AM to midnight! The thick line just under 6 AM is the Google Calendar email updates I used to get every morning. I stopped getting those once I got an iPod Touch this past Christmas. I can’t remember what email used to come at 3 AM for a few years. This next graphic shows the average number of emails I receive per day for each month. My amount of emailing ramped up once I started using email. Notice the downward trend on incoming emails recently: I’ve been unsubscribing from unnecessary mailing lists and circulars. My emailing had pretty serious peak last May right before I moved to Boston. Not sure why. Here we have a histogram of the time at which I send emails. Apparently I’m most likely to send an email just after 10 PM. I wouldn’t have guess that. Don’t expect to hear from me after midnight! As a good operations researcher, I wondered if I received email according to a Poisson process. 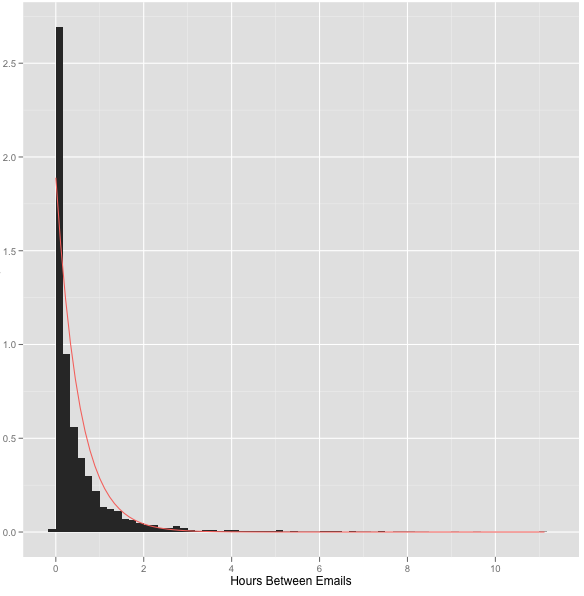 I pulled the email time stamp data into R. I get email pretty steadily between 8 AM and 10 PM. I looked at the emails that arrived in that interval since September 2011. The mean interarrival time is 0.53 hours. The standard deviation is 0.92. If it were a poisson process, interarrival times would be exponentially distributed, and the mean and standard deviation would be equal. 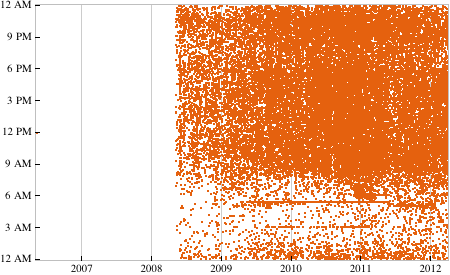 Below is a histogram of the interarrival times of my emails. The red line is an exponential distribution with the rate set to 1 over the mean interarrival time of my emails. It’s not a terrible fit!2 One reason the email arrival rate might not be exponential is that I frequently have back-and-forth email conversations with people, which skews the distribution towards short interarrival times. I might do some more statistics later, but I have homework to do.